PS. I thought I could enjoy this rojak peacefully...but the other half Asian girl start picking the other bamboo skewer and start poking on the ingredients that I didn't add any rojak sauce. She started with apples, then mangoes, then she ate the tau pok and said 'sedapkan daging'? Hahahaz whatever lah girl as long as you are happy....she ate everything except the blanched bean sprouts. Source : Zuwati's Pocket ;) hehehez & my own 'rojak' estimation. Put all the ingredients in a pot and simmer on low to medium heat until it thickens. You can adjust the amount of the ingredients according to your own taste bud. Cut all the above ingredients into desired sizes. Toss the ingredients with some of the rojak sauce. Sprinkle toasted peanuts before serving. Do u prefer tau pok? perhhh..sedappnya, ayah mas pandai wat tauu...memang sedapp...dah terliur tengok ni..hulur la sepinggan..he.he..
Hmmmmm mmg sodap ni Mas, resepi main campak2 hentam keromo ajer...hehehez. Adeeehhh nasib baik semalam waktu keluar ku dapat ngap tu rojak cina.. sungguh pekat dan sedap wooo..
Memang tak rasa tahun ni eh... teringat waktu u first wrote to me pasal pandan chiffon cake anywho.. happy new year to u and ur family ok.. hv a wonderful year ahead! Hi Anie, wow! I love this rojak! For sure dua pinggan lichin, ha ha. Wishing you and all at home the very best of the new year....Happy new year, Anie. Stay young and keep a song in your heart. Tu arh cepat betul masa berlalu kan :( Dulu masa small2 nak sgt masa berlalu cepat....haiizzz sungguh ku menyesal wahahaz dramatic seh >.< Alhamdullilah tks to u yg tak lokek share knowledge that I berjaya bake the cipon, I really2 appreciate it. Thank u for visiting and leaving a comment in my blog ;) I really appreciate it. I tertinggal ketapi nih .. Happy new year to you n family. Rajin2lah masak or bake makanan yg enak2. Dapat baunya aje, I dah boleh gemuk taw, hehe. 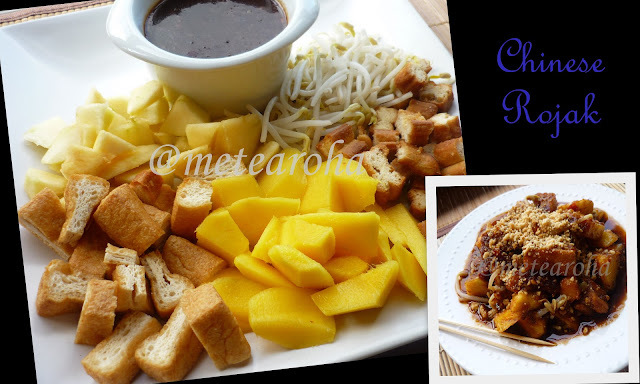 Maybe I shd live kat overseas so that I too can make rojak? Wahahaha.,. Tak per lah biar lambat asal selamat ;) hehehez Happy New Year to u and family too Cik Som.